The new product, Context, also provides analytics on expert witnesses, and may be the most comprehensive product available for this purpose. In a way, Context is déjà vu all over again. The original version of these judge analytics was launched by Ravel Law in 2015. 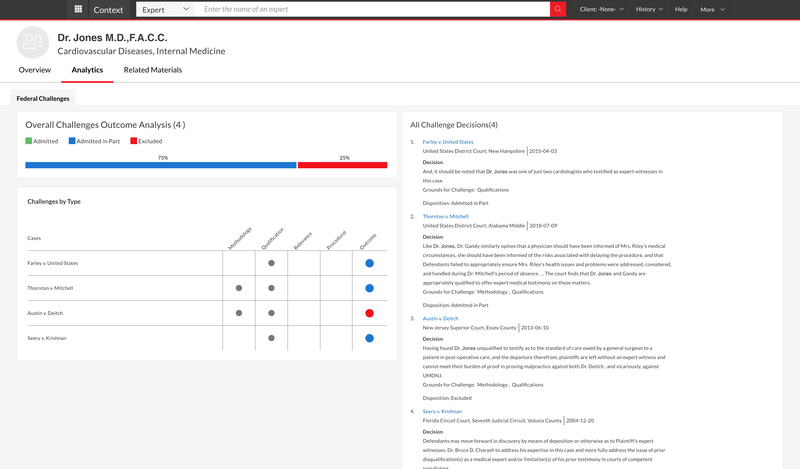 After LexisNexis acquired Ravel in June 2017, development pivoted to incorporating Ravel’s tools into the Lexis Advance legal research platform. The first stage of that incorporation came last June, when Lexis Advance integrated Ravel’s case law visualization tools as a product called Ravel View. Today’s launch of Context is the second major step in that integration. That said, Context is a more powerful analytics tool than the original product, Ravel’s cofounders Nik Reed and Daniel Lewis told me during a call this week. Both now work for Lexis, where Reed is senior director of product and strategy and Lewis is general manager. Both say Context has been made stronger by the far deeper pool of data and more advanced technology available through LexisNexis. Today’s launch, with judge analytics and expert witness analytics, is the first phase of Context. 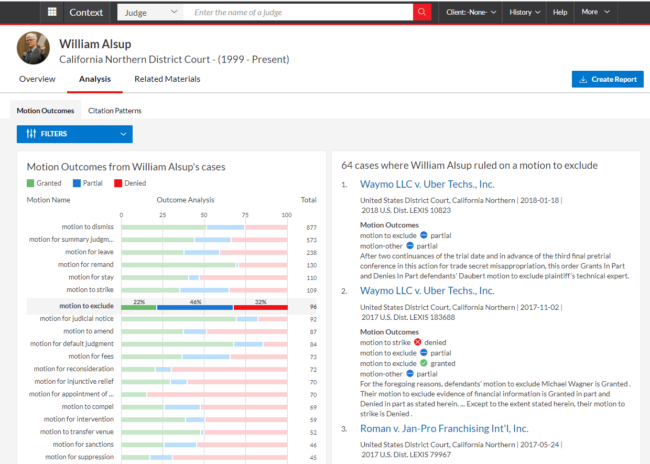 Future releases will add court analytics, company analytics, and lawyer and law firm analytics. What makes this product unique among litigation analytics tools is that it analyzes the language of court documents. Other litigation analytics products, such as Lex Machina, which is also a LexisNexis product, or Westlaw Edge, are based on analysis of court dockets. Those products can tell you information such as how long a particular type of case is likely to last, how a judge is likely to rule on a particular type of issue, or how other lawyers have fared before a particular judge. Such information is derived from the docket. Motion outcomes for U.S. District Judge William Alsup. By contrast, Context analyzes the text of court documents to find language and citations that could prove persuasive to a particular judge. Specifically, it tells you how a judge has ruled on 100 different types of motions and the judges, cases and text the judge most commonly relied on in making those rulings. Say you are filing a motion for summary judgment. Using Context, you could look up the judge and determine the rate at which that judge grants or denies summary judgment. You could see all of the specific cases in which the judge made these rulings. Then, going deeper, you can see the opinions that the judge most frequently cites in summary judgment cases, and even the specific text from those opinions that the judge most frequently relies on. Citation analytics show the cases and judges a judge finds persuasive. With this information, you can tailor your memorandum to fit the judge. You can cite the judges, cases and even passages that you know the judge has relied on in the past and finds persuasive. That is a powerful tool. Context’s judge analytics cover all federal judges, including appellate judges, and some, but not all, state court judges. Because appellate judges do not rule on litigation motions, motion analytics are not available for them (unless, I presume, they were previously a trial judge). However, citation analytics do work for appellate judges, so you can see for opinions authored by that judge the cases and text they most commonly rely on. There is no backward time limit to Context’s coverage. If a judge has been on the bench for decades, the entirety of the judge’s output is included in Context’s analytics. The expert witness analytics released today are a new analytics product not previously offered as part of Ravel’s original set of analytics tools. The reason for that is simple: Ravel did not have data on expert witnesses, but LexisNexis has an extensive set of such data, covering more than 380,000 experts. For each expert covered by Context, a user can see an overview that provides biographical and experiential information about the expert. For many experts, this includes not only the expert’s current CV, but also prior versions of the CV has it has been presented over the years. The overview also shows whether the expert is typically hired by plaintiffs or defendants, the number of cases per year the expert is engaged in, and the expert’s experience by jurisdiction and areas of law. A deeper layer provides analytics on Daubert challenges to the expert. Nik Reed calls this a scorecard. For each expert, it shows the challenges by factor — methodology, qualification, relevance or procedural — and then the outcome. As you look at this scorecard, you can view each of the opinions in which the challenge was decided. Reed says these analytics can be useful both when retaining an expert, to see how that expert has fared historically, and when challenging an opponent’s expert, to see which grounds have been successful in the past in excluding that expert. These expert analytics cover only federal court challenges, but Reed said state court challenges will be added by the middle of 2019. Also in the works is attorney and firm connections, so that a user can see the specific attorneys and firms to which an expert has been connected. There are other expert-witness analytics products on the market. 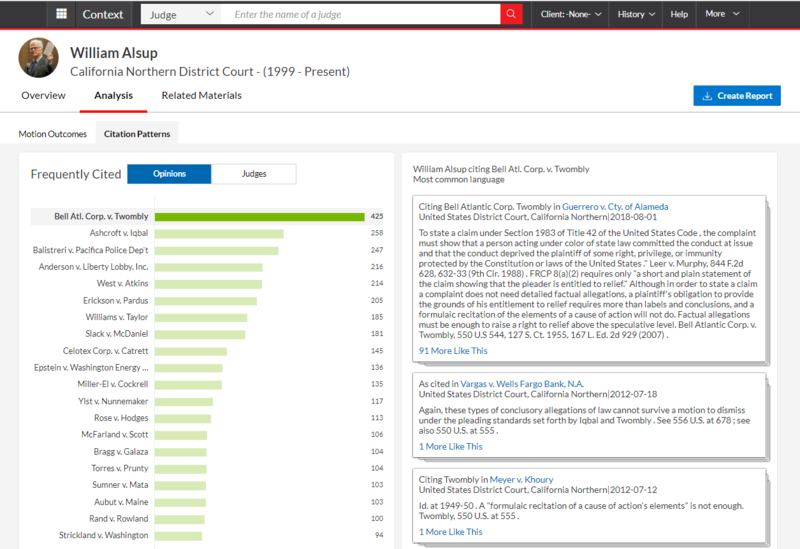 Among the most comprehensive is Courtroom Insight, which has its own expert witness analytics and which also is integrated in the Fastcase AI Sandbox. It covers some 100,000 expert witnesses. Reed and Lewis said that the product being launched today is just the beginning. The next module to be added will be court analytics, which will break down the handling of specific types of motions by courts, rather than just specific judges within those courts. These will be similar in concept, but not scope, to the court analytics previously offered by Ravel, which I wrote about here. After that will come a module providing analytics on companies as litigants, and then a module on lawyers and law firms that will show data such as success rates on particular types of motions and before specific courts or judges. Again, these will be similar to the law firm analytics previously offered by Ravel, which I wrote about here. This latter module will be useful to researchers not just for litigation strategy, but also for performing competitive analysis and intelligence, Reed and Lewis said. 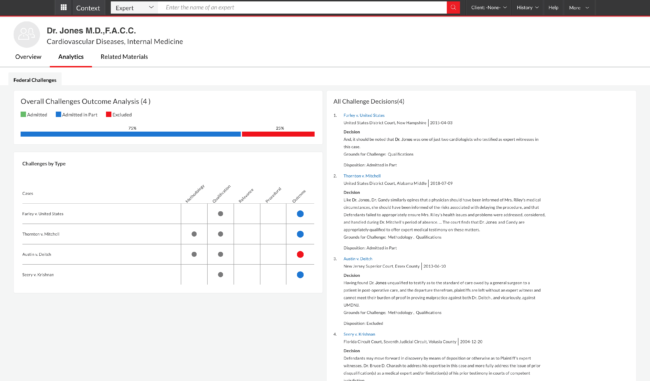 LexisNexis is offering 30 days of free access to Context to any Lexis Advance subscriber who registers at www.lexisnexis.com/context. The free trial will run from Jan. 2 to Jan. 31, 2019. In addition, LexisNexis is providing free access starting today to all law school faculty, and to all law students who have a Lexis Advance ID starting Jan. 2. Also starting today, access to Context will be provided to all current customers of Ravel Analytics through its legacy site. Otherwise, for Lexis Advance customers, Context will be sold as an add-on to their subscription. Subscribers will be able to choose from among different modules. The two products released today will be sold as a single module. The modules will also be sold in packages oriented to either legal research or competitive intelligence. LexisNexis declined to provide specifics on pricing.